A complete Greek dinner of lamb and a wilted “spinach salad” with a starter of grilled vegetable pizza. Learn about the different cuts of lamb in our Lamb Glossary. Photo courtesy J.M. Smucker Company. 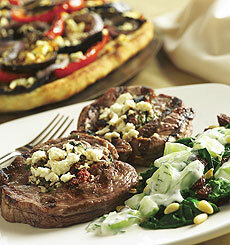 This recipe for a grilled Greek dinner was a finalist in the 2009 Crisco Grilling Hall Of Fame Contest. This is Page 6 of a 15-page recipe series. Click on the black links below to visit other pages. You can read more about the contest on Page 1. For a casual and delicious dinner, start with Grilled Vegetable Pizza. Then, serve the Leg Of Lamb Pinwheels with the Grill-Wilted Spinach With Tzatziki. Serve sorbet for a light and luscious dessert. For vegetables, preheat grill to medium high. Spray vegetables with cooking spray and season with salt and pepper. Place vegetables on grill spaced evenly, tomatoes to coolest part of grill. Grill for approximately 3-6 minutes per side, tomatoes may only take 2-3 minutes/side. When done, set all vegetables aside and slice portabella cap in 1/4-inch slices. For pizza dough, kneed the dough to package instructions, then allow to rest approximately ten to twenty minutes. Stretch and flatten to approximately one square foot in size, any shape that will fit on your grill. Start the stretching in hands, place on flat cool surface, flatten outward from center, and then stretch evenly in your hands. Heat grill to high with cover down. Spray grill with cooking spray. Place dough on grill with cover down till golden brown on underside with dark grill lines. Turn over and assemble pizza, distributing vegetables as desired, tossing on feta cheese and oregano/marjoram. Grill another 5-10 minutes till other side is golden brown and the cheese is melted. For the tzatziki, combine yogurt with diced cucumbers and chopped dill fronds. Clean spinach and spray with cooking spray. In a grilling basket or straight on grill, place spinach and allow to wilt 2-3 minutes. If directly on grill, place spinach when grill is very hot, then turn down to medium. When sufficiently wilted, transfer spinach to a salad bowl, toss in remainder of ingredients, then drizzle with tzatziki and red wine vinegar. For marinade, place olive oil in bowl, then whisk in red wine and balsamic vinegars, followed by spices. Place leg of lamb in a bowl or pan with marinade for 1.5 to 3 hours, turning once. For the lamb pinwheels’ stuffing, combine sun-dried tomatoes, chopped garlic, mint, egg and coriander in a bowl and fold together. Open leg of lamb, pat dry, and season with salt, pepper and coriander. Spread stuffing over lamb. Place spinach over stuffing. Roll leg of lamb like a jelly roll. Tie lamb with twine: starting at one end, circle rolled lamb and tie. Tie full length with individual ties approximately 1-1/2 inches apart. Slice individual wheels between ties, careful not to cut strings. Season individual wheels with salt, pepper and coriander. Preheat grill to high and spray pinwheels with cooking spray. Note: wheels are fragile; a light spray will keep wheels from sticking but allow browning. Place wheels on high heat, turning it down after wheels are placed. Grill 7 to 9 minutes. Turn very carefully (holding wheels between two spatulas if needed). Grill another 5 to 6 minutes or till desired doneness. After 2 to 3 minutes, sprinkle with feta cheese, then top with more when fully cooked. Serve Lamb, pizza and grilled spinach together.